Legal Punchlist | Harmon & Davies, P.C. 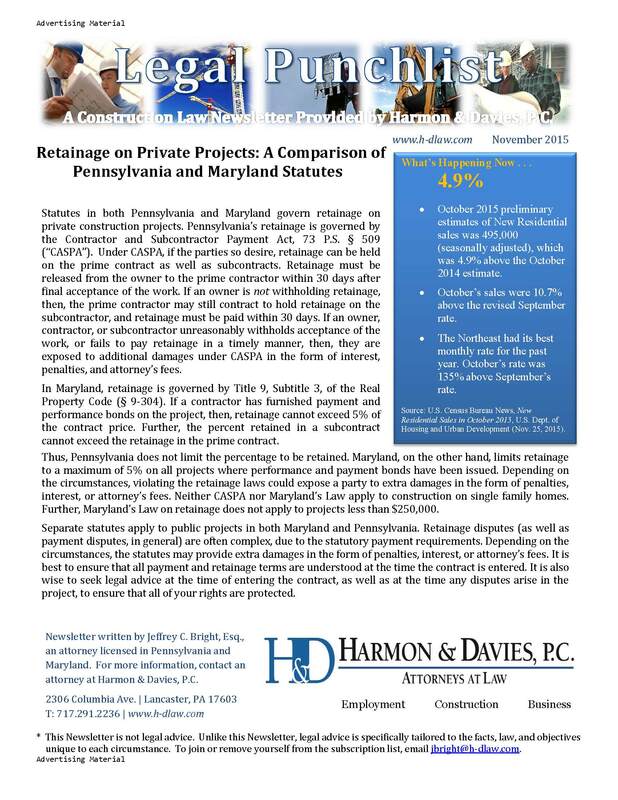 A Construction Law Newsletter Provided by Harmon & Davies, P.C. · Increase in construction spending, year-to-date. · The first 10 months of 2015 have seen $888.1 billion in construction spending. · The first 10 months of 2014 were $802.3 billion. Source: U.S. Census Bureau News, October 2015 Construction at $1,107.4 Billion Annual Rate, U.S. Dept. of Commerce (Dec. 1, 2015). Construction contracts often reference either mediation, arbitration, or litigation. But what’s the difference between these three? Mediation is the use of a third-party to conduct an informal meeting for the purpose of resolving the dispute. There is no judge or jury. It is merely a mechanism to get all the parties in the same room. Typically, but not always, the mediator is selected and hired by the parties to lead the settlement discussions. It’s also common for mediation conferences to start with all parties in a single room, discussing their grievances and desired outcomes. After the initial group discussion, it is common for each party to relocate to separate rooms, and the mediator will meet with each party individually, to facilitate points for discussion. Generally, a mediator is hoping to bring each party towards middle ground in search of a negotiated resolution. It is important to ensure that mediation is conducted under the confines of 42 Pa.C.S.A. § 5949. This statute provides that the communications made in mediation are inadmissible as evidence in a court of law. This protection allows the parties to speak freely, in an effort to resolve the dispute. Settlement discussions are also inadmissible in a court of law, under Pa.R.E. 408. Best practice is for all parties to agree in advance, as a ground-rule of mediation, as to whether the statements are fair game for use in court at a later point. Mediation does not result in a binding decision. It is merely an attempt to facilitate a negotiated settlement. Arbitration, on the other hand, is a formal procedure that results in a binding decision. Arbitration does not use a judge or jury. Instead, an arbitrator presides over the arbitration and acts as the “judge and factfinder.” Arbitrators are usually practicing attorneys who likely have a concentration or level of expertise in the specific area of applicable law. Arbitration is less formal than a trial in court; it is often held in a private office, or a conference room. Although less formal than a trial, the litigants must still present testimony and evidence, in a similar manner as if presenting their case in court. Sometimes, people use the terms “binding” or “non-binding” arbitration. These are misnomers. By definition, all arbitration is binding. If it is “non-binding arbitration” then, it is better defined as mediation. When agreeing to participate in mediation or arbitration, make sure that it is fully understood and agreed that the process is either binding or non-binding. The best way to make this clear is to use the proper terms: mediation is a non-binding; arbitration results in a binding decision. This should be clarified in writing, between the parties, as a ground-rule for participating in the process. Litigation, in contrast, is the use of the court process. At the time of entering the contract, and at the time of any dispute arising, it is important to know whether the contract requires mediation, arbitration, or litigation. Posted in Construction | Comments Off on A Construction Law Newsletter Provided by Harmon & Davies, P.C.